Made of 14K Yellow gold, the face of the ring contains 39 VS1 genuine yellow diamonds (.56cts) pave set, two white gold trophies with 22 full cut white diamonds (.27 cts) pave set, and two individual .25 cut brilliant cut diamonds, bezel set for the ball. There are also two .15ct white diamonds set in the ring's bezel. 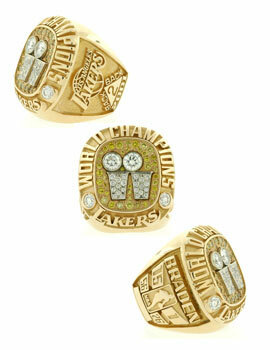 Presented to players & front office personel to celebrate LA's 2nd NBA title of this era. VERY IMPRESSIVE & VERY RARE! !